What’s Wrong with all Black? Whenever I am having a hard time picking out an outfit for my day, I always resort to black. All black everything is my GO TO. Even though black is a very dark and eerie color, it looks clean and sleek on everyone. However, I know some people do not feel comfortable to wear all black. Is it really that bad to wear all black? Do I look funny wearing all black? The answer is, absolutely not. You should wear whatever fits best to your style. Whether it is a preppy, grungy, edgy, or classic look, you can always pair black on black with any style. When picking out your all black outfit, the first step to do is to pick our your favorite pair of black shoes. Why would you start with the shoes? When picking out an outfit, the shoes are the most important part. If you have tall boots, a flat, or a heel, you would wear a different type of black pant with each to fit the style you want to show. Next, pick the pants that suit you and your shoes best. Lastly, choose your favorite black top that you will feel most confident in. 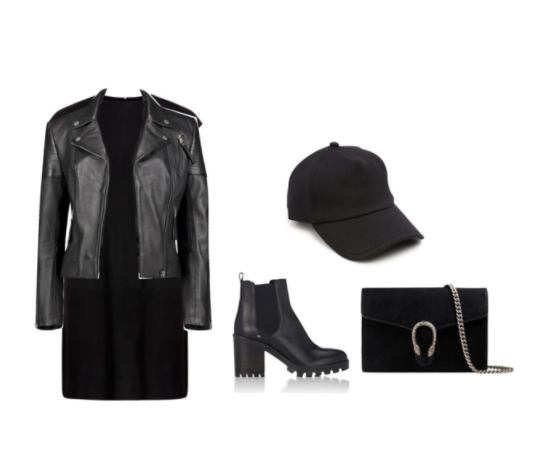 Here are some of examples of black on black options for your everyday wear! Be confident in what you’re wearing. You have to own the outfit and make it your best. There is no reason why all black everything is not your style!